12 Holiday Cooking Tips — Dine on In! I recently shared a once a day cooking tip as part of my 12 Days of Cooking Tips on my Social Media Accounts. Boy that was so much fun! I wanted to share them ALL in a blog post today, primarily because it makes it much more easier to read at once, but also because cooking tips are essential for success in any kitchen. Have a bunch of herbs and can't find yet another way of using them? Mix with room temperature butter (or ghee) and use whenever you need an added piece of umph' in your dishes. I like to add to my finished quinoa, rice, or roasted root vegetables. Yet they also make a nice finisher to any protein of your choice. So, you're chopping vegetables and you have all those ends left over. What do you do? You probably throw them into your compost or your trash right? Well stop that right now! Turn those scraps into a gorgeous homemade vegetable stock. Store then ends into a zip top bag and keep in freezer. Each time you have scraps, add them into the bag. Once it fills up, dump them into a stock pot, fill with water and your favorite spices and let er' rip (that means bring to a boil, then simmer for 2 hrs). Strain out the vegetables and you are left with gorgeous veggie stock that turns ANY dish into heaven. Have root veggies on hand? Squash, Potatoes, Carrots? Roast them in your oven (half them and drizzle them with oil and your favorite seasonings and roast them at 350 degrees for 20-25 minutes until fork tender). Take them out, spoon them onto your food processor (Ninja, Vitamix, Blentec, household blender) and purée with 1 cup of stock for instant soup. That dinner in 30 minutes! Yum. So you're home from the market with bag fills of produce. How do you set yourself up for success for a healthy week? Rinse, Chop and Dice. Keep the veggies separated so you have instant access to them when you want them for the week. This makes an easy way to sauté, roast, or steam any for a healthy side any day of the week. In our home we always have at least one day where I'm like "screw it, let's make a sandwich for lunch/dinner!" Having pesto readily available makes me "up my game" in the sandwich department. Heck it does that for anything really. 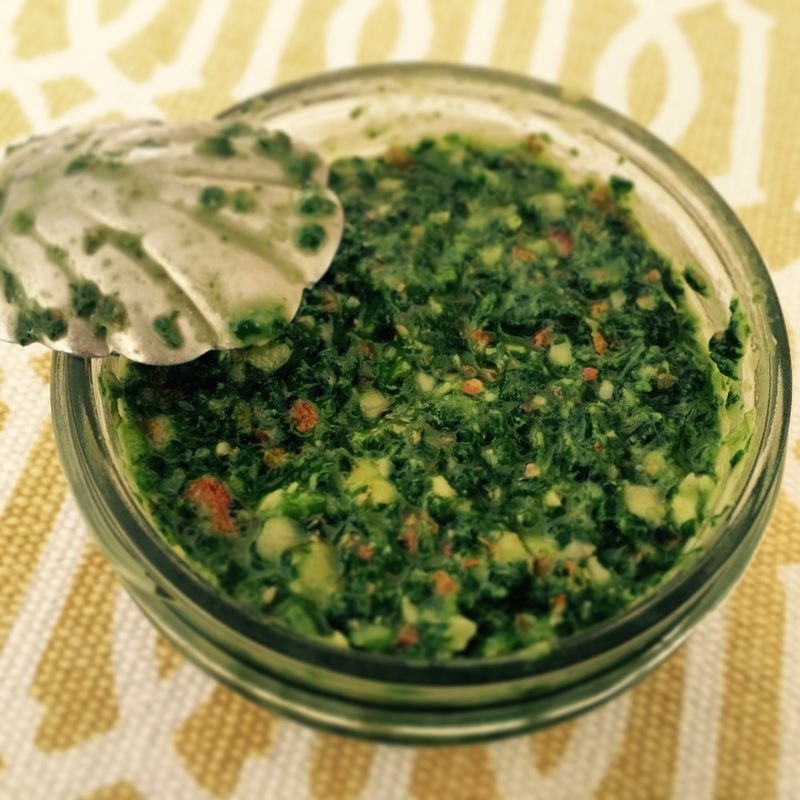 Pesto is so versatile and works well in place of mayo. It also makes a great condiment for a grilled cheese sandwich. 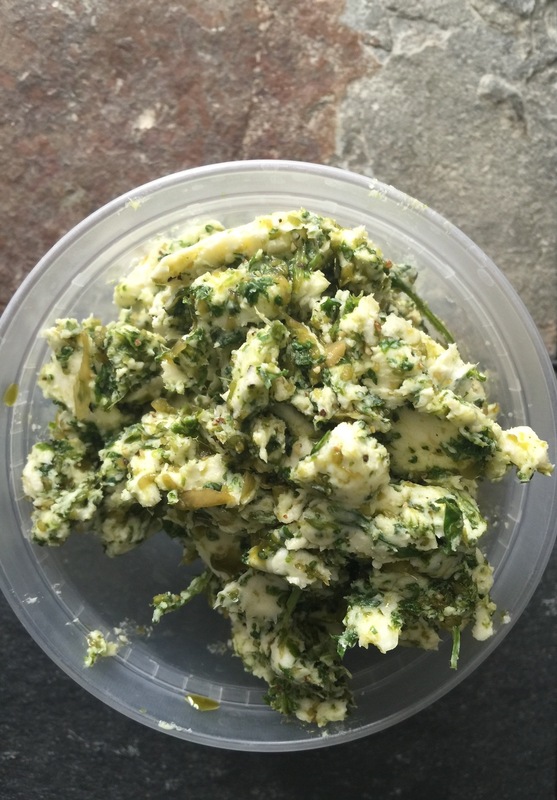 So make a pesto at home, it's really simple and it can last up to 3 months in your fridge (if you omit the nuts and dairy) and 6 months in the freezer. We all have those days where we want something sweet? If you got 1 cup of fresh fruit (in my home we love watermelon so we use this often), 1 can of sweetened condensed milk, I can of coconut cream and 1 tsp of Balsamic Glaze (make your own by simmering 1 cup of Balsamic in a sauce pan until it reduces and it can coat the back of your spoon), you can make your homemade ice cream in the morning before you go to work, and devour it when you get home. This is all you need, add the ingredients to a blender- store in a plastic container and voila instant ice cream! Take cauliflower or broccoli. 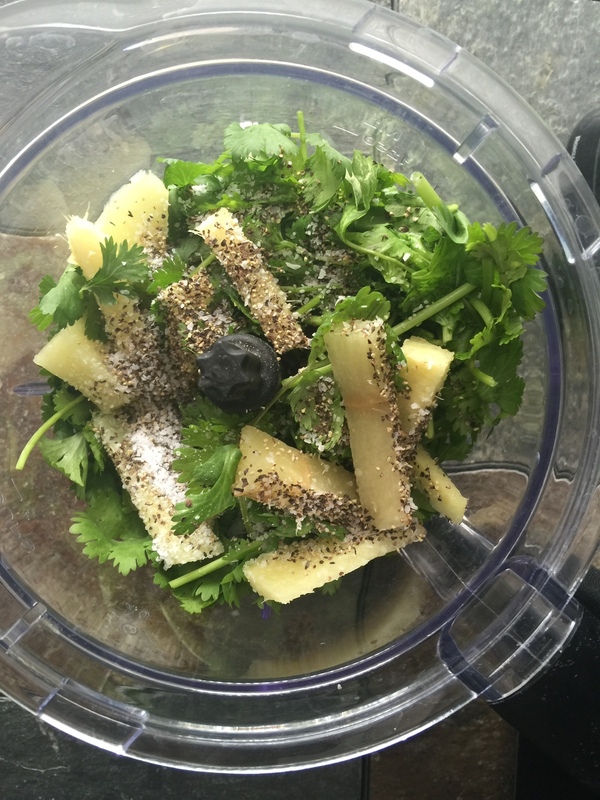 Pulse it in your blender, Vitamix, ninja, Blentec, etc). Sauté it over medium heat and season for an instant side to help along that dinner meal. Want to do something with the leftover? Add one egg, grated cheese and form into patties for savory pancakes for the next day over a medium hot skillet. I love oats! I especially like the steel cut ones. What I don't enjoy about them is the mushiness. Texture is often weird to me, but I need a healthy snack on the go that can live in a mini fridge, or a replacement for a hard boiled egg. Cook oats with water and 1 tsp (or 2 depending on your love for) cinnamon until they come together, then add 2 tsp chia seeds. The chia seeds expand with liquid which will cause you oats to gelatinize. Add this to ramekins or little custard cups and refrigerate. These are powerful snacks to keep you going when you need that afternoon coffee. Yes, a green smoothie. I make these on weekends when I got time leisurely drink them. Not only are they good for you, but it's a good caffeine replacement (because I'm sure you go WAAAAAY OVER the 2 cup maximum in your day). Blend this and share with a friend. Sometimes I only drink a little bit, sometimes I drink the whole thing. Either way, it's such a good break from the caffeine. Have leftover potato or root vegetable peels. Keep them. Toss them with Olive oil and season. Bake them for 10-15 on a parchment lined cookie sheet at 400 degrees. Let them cool and enjoy them as a healthy alternative to other salty snacks. Every Monday, I prep myself an egg bake of some sort to make starting my day much easier. Usually I start with whatever veggies are already chopped. I sauté them over medium heat in a pan. Then I make my custard (6 eggs and 1/3 c of milk [or half n half; you do need dairy here; I've tried using alternatives- doesn't really work- but feel free to tell me otherwise- I'm willing to try dairy free again!]). Combine the egg custard in a Pyrex liquid measuring cup (feel free to use a bowl if you're hand is steady). Season the egg mixture and add to veggies and let them set up like an omelet would. Reduce the heat to a low heat and cover. Cook for 20-25 minutes until set. Uncover and turn off heat. Let cool and enjoy. This makes breakfast time easy. I love easy. This is something that I make pretty regularly. Use store bought kernels, heat a sauce pan on medium heat then add enough oil to coat the bottom of pan. Take 1 c of kernels, add to pan and cover. The kernels will "pop" like crazy (it's always like hearing champagne pop for me; YIPPY KIE- YAY!) , and also once you hear them slow down on the "pop" turn off the heat. This just made your movie night didn't it? Go and have fun. Enjoy the movie. So there you have it: 12 Days of Cooking Tips to help you get that kitchen confidence back! Have a great time with the tips!